Last year the Wildcats struggled early on but got hot late in the year in route to winning the Atlantic 10 and becoming a 12 seed in the NCAA Tournament. The Wildcats were bad to start the season, going 5-6 in non-conference play, which included losses to Appalachian State and Hawaii, as well as losses to four NCAA Tournament teams. The Wildcats then lost their Atlantic 10 opener at Richmond to drop to 5-7 overall. The Wildcats then started to find their rhythm winning their next five games, before dropping two straight to move to 10-9 overall. From then on the Wildcats began to roll, winning 8 of their final 10 regular season games to finish 13-5 in Atlantic 10 play. In the Atlantic 10 Conference Tournament the Wildcats beat St. Louis, St. Bonaventure, and Rhode Island in route to winning the Atlantic 10 tournament. The Wildcats then played Kentucky in a 12-5 matchup and they were able to keep that game close, although they fell 78-73 to finish the season 21-12. The Wildcats were led by senior Peyton Aldridge, who averaged 21.2 points per game last season. Freshman Kellan Grady showed that he is the future of this Davidson program by averaging 18 points per game in his freshman season. Jon Axel Gudmundson played the role of point guard averaging 13 points and 5 assists per game, which was key for the Wildcats. The Wildcats have loaded up with another decent non-conference schedule before conference play hits. The headline of the non-conference schedule will be when they head to the Charleston Classic, where they will play Wichita State in the first game, they also could wind up playing Purdue, Virginia Tech, or Alabama depending on how the Bracket breaks. The Wildcats will also play a neutral game against Temple and two road games at Wake Forest and North Carolina in non-conference play. The Wildcats open Atlantic 10 play January 5th against Duquesne and finish it March 9th at Richmond. They will play Rhode Island, St. Bonaventure, Richmond, St. Joseph’s, and Fordham twice, while playing everyone else in the Atlantic 10 just once in conference play. The Wildcats lose two starters in Peyton Aldridge, an elite playmaker at the Atlantic 10 level and one of the best players in program history, as well as big man Oskar Michelsen. They also lose two key reserves in Will Magarity and Rusty Reigel, who both were key bench players last year. Aldridge will be tough to replace scoring wise, however, they do have other players that could step up in his place. One of those players being Kellan Grady who put up big numbers as a freshman last year, I expect Grady to score about what Aldridge did last season while stepping into a team leader role. 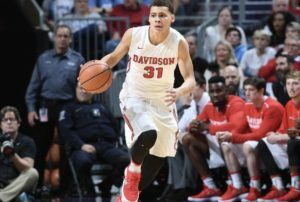 Jon Axel Gudmonsson will probably once again be a do-everything type guard for the Wildcats this season, I expect him be a good second option on offense, a good rebounder, a good passer and a key switchable defender, his ability to do all these things can help make Davidson a great team. KiShawn Pritchett is another kind of do-everything type player, who should step into more of a scoring role as he will get more shots this season. Carter Collins was mostly overshadowed last season but his experience should allow him to come in and be a good role player. Both Nathan Ekwu has been a solid player in the past, before missing last season with a knee injury, which should make him the likely starter. Of the four freshmen Luka Bradjikovic, Michael Jones, David Czerapowicz, and Nelson Boachie-Yiadom, two should step in and become an impact player in year one at Davidson, which could be the key to them getting back to the NCAA Tournament. The Wildcats obviously have the talent at the top to replicate their success last year but they will need some other players to step in and fill holes right away to do that. The Wildcats look like the team to beat in the Atlantic 10, which is in part because they have the talent and experience that is needed at the Atlantic 10 level. In the Charleston Classic the Wildcats should beat Wichita State, to get into the winner’s bracket, to where they will play better competition, from there they could lose a couple games, although even then they should help their NET rating. They will play a couple more winnable game at Wake Forest and in New Jersey against Temple, before their big game at North Carolina. Ideally, the Wildcats enter conference play at 10-3 or better, because that will get them in a position to get an at-large bid. If they can continue to play at a high level, they should go 15-3 or 14-4 in conference play and win the Atlantic 10 outright. From there they will enter the Atlantic 10 tournament as the favorites to win the league tournament and get an at-large bid. If they get into the NCAA Tournament, they are a dangerous first round matchup for a 5 or 6 seed and they could wind up making a second-weekend run if things go right.